This vibrant, colorful succulent grows quickly and easily. 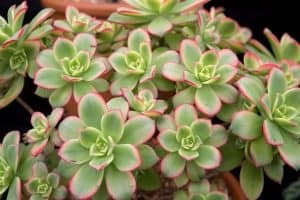 It has a few peculiarities not shared by other succulents, such as an aversion to very hot, dry weather and the desire for a bit more water. Kiwi Aeonium has a nicely corresponding scientific name: Aeonium ‘kiwi’. It is thought to be some sort of hybrid of the Aeonium haworthii, hence it is sometimes called Aeonium haworthii “tricolor”. It is a favorite among novices and experienced horticulturists alike for that very trait – its tricolor leaves. 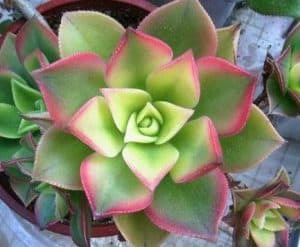 With a little bit of sun, these gorgeous succulents display leaves that start yellow and darken into green, the edges of the leaf bordered with pink or red. During the late summer, they occasionally produce large, yellow flowers. Kiwi Aeonium is a monocarp, so it dies after flowering. This is one of those rare succulents that is actually dormant during the summer. Instead, most of its growing occurs during the winter when conditions are a bit less harsh. While it can survive outside In summers that are not overly hot and humid, it will appreciate being indoors during that season. It may also be able to skip the dormancy phase completely, continuing growth year-round. It is just as at home in pot on a windowsill as it is outside, so you’ll find it hard to use the excuse that you don’t have enough space. Like many Aeonium, it can survive with very little intervention. However, regular pruning and attention will lead to more dense, attractive foliage. This plant is somewhat unusual in that it prefers to be a bit moister than many other succulents. Use the finger test to determine if it is time to water: stick a finger at least 2 inches into the soil and make sure it is dry. You’ll probably end up watering about once a week, like most other succulents. During its active growing period (winter to spring), you should water it more frequently. They tend to be more forgiving of excess water than other fat plants. When it is dormant, usually the summer, water it only if you see the leaves wrinkling. Succulents that are dormant need little to no water. Their drinking habits are, in part, to their root system. Many Aeoniums have very little in the way of roots other than an anchor and a few thin roots near the surface to drink up water. Where most succulents desire deep drenchings occasionally, the Kiwi Aeonium leans a little bit more towards less water, more often. Don’t get me wrong – you can’t go treating this like your basil plant that demands water daily. It means every 4-6 days during growing season. Kiwi Aeonium is a succulent. Succulents like sun. Everybody knows that. That exquisite coloring that is unique to the Kiwi Aeonium is largely dependent on getting sufficient sun. However, these guys are prone to burning more than other succulents might be. Where a Kalanchoe might thrive in direct sunlight all day, the Kiwi only wants direct sunlight for a couple hours. They can even make do in environments where they don’t get direct sun at all. You might lose a bit of the vivid coloration, but that versatility is useful to people who don’t have enough space in the sun, or like to keep plants indoors. Use a growlight if you have trouble getting enough light indoors. Note that during hot summers the Kiwi Aeoniums leaves might begin to curl. This is a behavior that reduces the area of the leaf exposed to sun, which helps prevent water loss from evaporation. It’s not harmful to the plant, but if you don’t like it you can bring them plant inside and it should recover shortly. 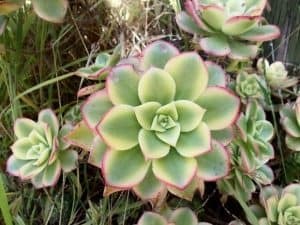 At this point in your succulent journey, when you are considering picking up a Kiwi Aeonium, you already know that succulents want fast-draining soil. You know that regular potting soil doesn’t really cut it, but you can amend it with sand, gravel, and perlite to rectify that. 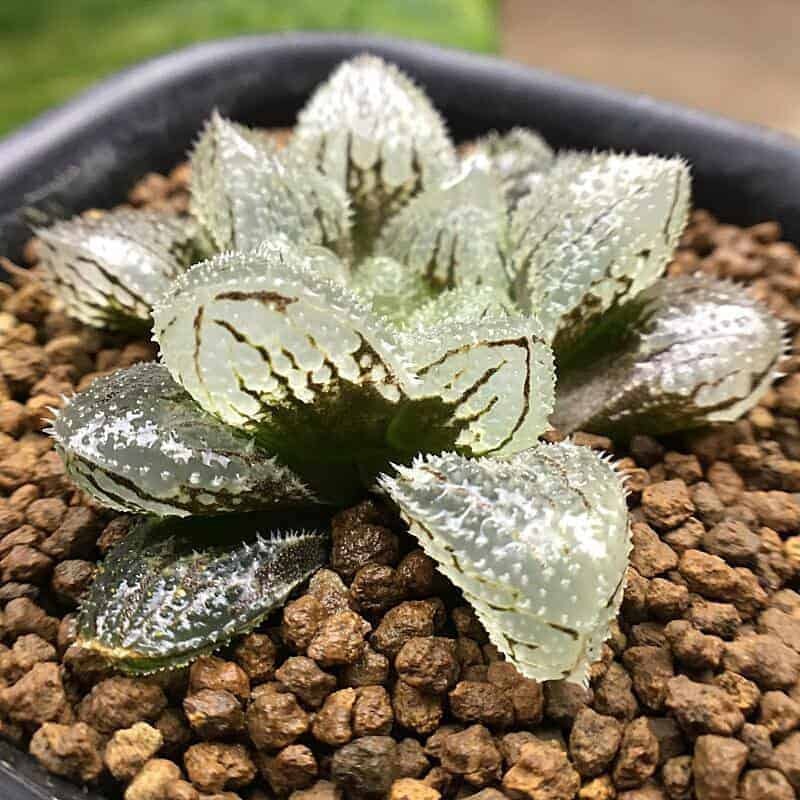 You are also aware that there are several excellent succulent and cactus soils that are ready to go straight out of the bag if you don’t feel like getting your hands dirty. In all seriousness, make sure your soil drains well. While Aeoniums can handle a bit more moisture than other succulents, there’s no reason to push your luck. Likewise, quick-draining soil is no good if your pot doesn’t have a drainage hole. 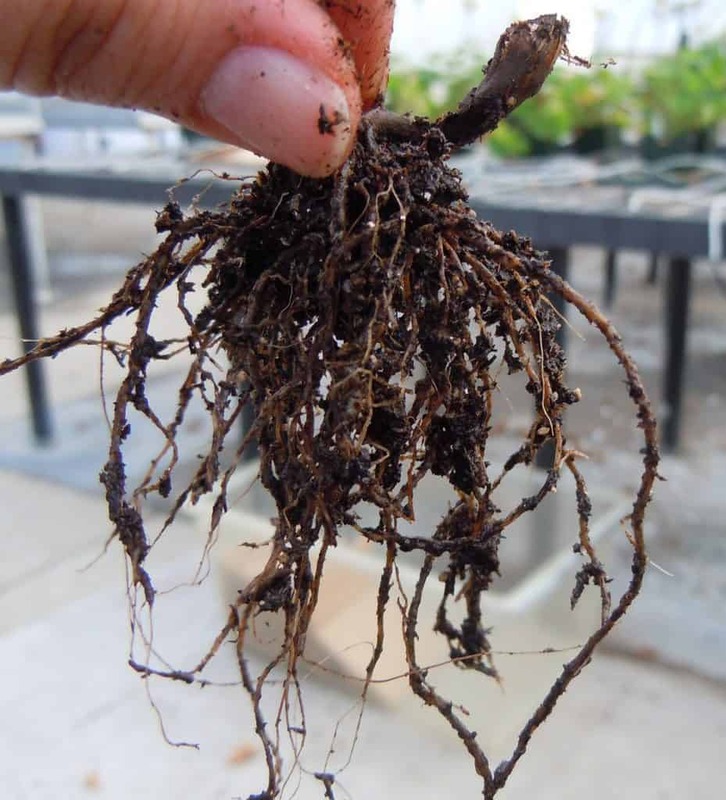 Always use containers with drainage, otherwise your risk of root rot rises dramatically. 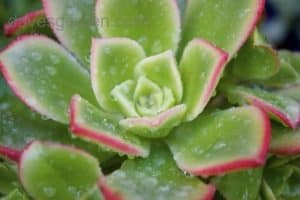 Aeonium plants are fantastically easy to propagate. Simply cut off a branch, wait for it to callus, then stick it back in the ground! Propagate during winter, the season of fast growth for Kiwi Aeonium, for best results. It’s possible year-round though! 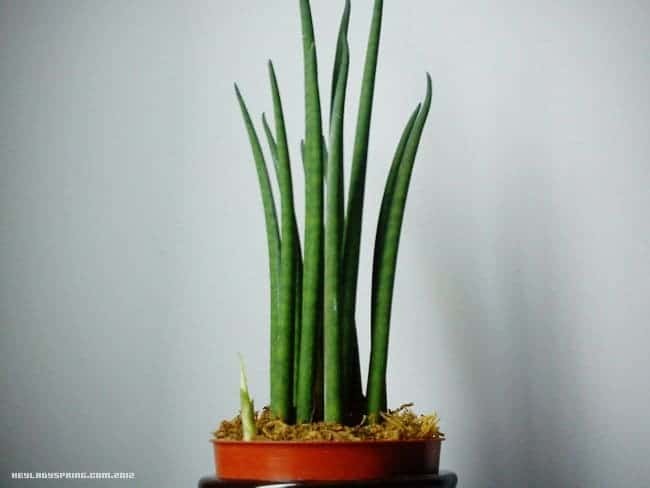 Since the plant grows two or three feet tall, you’ll have ample stem to choose from. Aeonium tend to mostly be leafy at the terminal ends of their branches, so you’ll have lots of empty space to cut. Cut a section about 4-6 inches from the end. The healthier the branch is, determined by the quality of the leaves, the more likely your Kiwi Aeonium propagation is to be successful. A clean cut is important to the process of callusing, so be sure to use sharp garden scissors. After its cut, leave it somewhere warm and dry for 3-5 days. The end of the branch will scab, or callus, which prevents infection or over-absorption of water. Then plant it in dirt. After a few weeks, it will grow tiny roots. You might need to support the plant while it grows its roots to anchor itself. Water it as you do the mother plant during this time. It won’t be able to absorb water until it has roots, but you can bet it will be thirsty by the time they show up! Aeonium sometimes propagate themselves too! They often get top-heavy as they grow larger. This leads to branches bending to the ground, or even breaking off entirely. Aeonium have a habit of growing “aerial roots” along the stem, far from the ground. When the branch gets to the ground one way or another, these will continue growing and root the plant! While you shouldn’t count on this method to get more Kiwi Aeoniums, you might find it has occurred in an over-grown specimen. You can separate these offshoots with a clean snip and repot them elsewhere! If you have any friends with succulents, they will no doubt be happy to share a clipping. Following the steps above, you can easily grow your own! Kiwi Aeonium is not an uncommon plant. You might be able to find it at large retailers like Lowe’s or Home Depot if you look diligently. If you can’t wait any longer – order online! There are loads of vendors, here are a few. Do you have any questions or comments about Kiwi Aeonium? Share them below! I received a Kiwi Aeonium along with another plant for Christmas to spruce up my apartment. Now I have never had a green thumb & was concerned that I wouldn’t be able to care for the plants properly. So far both plants are green, I make sure to give them water when the soil is dry. However the leaves of my Kiwi keep falling off! Is this normal? If not what do I need to do to prevent this? Thank you for taking time to read my comment, and hope you can help me out. I made sure to bookmark this page for my Kiwi Aeonium needs! Glad you found the page helpful! Aeoniums tend to lose lower leaves, so don’t worry about it. There should be a full, healthy rosette at the end of the stem though. You should only need to water about once a week. I have had one of these for over a year and love it. I just took it outside and a rabbit decided it was time to propagate it ? Now i have a bunch of rosettes to plant. My question is how do you get them to branch out and not just be one long tall flower? I also have a black rose type that has no branches. Is there a trick i am missing? Yeah, it’s pretty simple, actually. They branch naturally by themselves, but it’s random and slow. You can force branching by beheading the stem. That cut will eventually heal and it often forms a couple new rosettes that will grow into separate branches. Hi! Your information is very helpful. Thank you! I purchased “rescued” a large Kiwi Aeonium from a local nursery (it is struggling) and got it home only to find it was beseeched with meely bugs! ugghhh I think I have finally got them under control but the plant is still not looking healthy. It is loosing lots of leaves from the bottom of the rosettes. I did bring it inside on a west window sill. I have some photos I would love to have you look at and give me some pointers. I am new to succulents and love, love them! Yeah, we’ve all been there before! Aeonium kiwi usually doesn’t have a lot of lower leaves anyway (once they’re bigger), so don’t worry about it! I have a succulent that looks like a rosette and has very thin leaves, similar to the one you have pictured. It is just getting long and lanky. I realize the end can be cut and put into soil but can the pieces of the branch also be propagated? Not sure how to send you a picture. After you cut off the top part, the bottom will also eventually start sprouting new rosettes! If you mean chopping up a plant into more than two pieces then, no, those branches probably won’t take off. How much do I leave sticking out of the ground for the bottom part? And how much do I leave for a stem for the top part to put into the ground? It doesn’t really matter how much is on the bottom, but I’d leave an inch or so. For the top part – strip all of the leaves on the bottom two inches and stick it in the ground! Hi, thank you for this information. I have one that to me is doing fantastic however it doesn’t have a lot of pink on its leaves, they are mostly all green. It has created roots to stabilize itself as it has gotten bigger. But I would like to see more pink. Could it be getting too much sun? Seems very healthy though? I am not sure how to upload a picture here. Yeah, your plant sounds totally healthy. The bright colors is just the result of having a lot of intense, direct light. It’s very possible to be entirely healthy and still be plain green. Try giving it more sun and see if the colors come out in a few weeks! I have two yellow “flowers” coming out of the mid section of two rosettes. Will these 2 rosettes die or will the whole plant die. All the other rosettes are smaller. Thank you. It kinda depends how the plant is setup. The whole plant will indeed die when it is done flowering. If those rosettes are on the central stem, it’s possible they’ll die too. If they are buds, and only connected underground, they will be fine.